Dueling web video projects from two of the old/new media powerhouses, The Washington Post and The New York Times. Both attempt to take a fresh approach to what we call 'journalism'. Both succeed in different ways. First, earlier in the week, was 'onBeing' from the Post. Clean, simple and personal. Short stories of Washingtonians by Washingtonians courtesy great video interviews by Jenn Crandall and great interface design by Rob Curley and crew. It has proven to be one of the most successful pieces ever posted on washingtonpost.com. 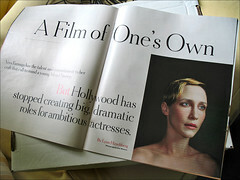 The Sunday New York Times Magazine online features director Jake Paltrow's commissioned piece, 'The First Ones', interviewing some of Hollywood's finest. The format is again, very simple - one question, "what was the first film that made an impression on you?" The answers are short and sweet and artfully filmed (almost painfully so), and it works. The interface is nice also, allowing you to watch the whole thing or pick where to enter. These two projects are not quite YouTube, but are also a nice step away from the TV-derivative stuff we are used to seeing from MSM. Hopefully we will see more like this; video journalism that starts to feel like the web is truly its home. Originally uploaded by Burnt Pixel. As our society, thanks to the dominance of TV and the increasing ubiquity of the Web, becomes more visual, how we present information is more and more important. While TV has gone for the shotgun; information dancing through every corner of the screen, and the web is still trying translate the 3-D world into HTML, print has centuries of practice and refinement under its belt. The result, on the best of days, is presentation that both stops you in your tracks and helps you move through words and pictures in a way that both informs and entertains. Babeth’s Feast - New York Times. Anyone who has been to my house or gone with me on vacation knows that magazines are a MAJOR part of my life. Its no accident that my two most favorite jobs were as a photographer for the Boston Globe Sunday Magazine in the late '80's and as Photography Editor of The Washington Post Magazine from 1999 till 2005. Growing up on Long Island, magazines were my escape; my dad brought home a bunch, including several photography mags, and National Geographic was always around. When I decided to make the switch from law to photography, magazines and photo books paved the way. Jill was one of those magazines that helped me make sense of what it was to be a photographer. It presented challenging fashion and portrait images in a tactile format; you could get personal with this mag, it was never stuffy or elitist. You felt like you held art in your hands, and for a very reasonable import price of $4.95, you did. My favorite issue of the mag! This one is better than several of the most recent. Weekend Guilty Pleasure - Salsa Fresca! Actress Eva Mendes does fashion with photographer Peggy Sirota in "T". The New York Times > Style > Slide Show > The Originals. Spool up the FTL Drive! "The interior of the Battlestar Galactica is a warren of shadowy, angular hallways and spare functional chambers split over two sound stages situated on the semi-industrial fringe of Vancouver, British Columbia. The Galactica is a spaceship, but it does not feel particularly space-age. The communication panels on the walls were scavenged from a Canadian destroyer; the desk lamps are from Ikea. 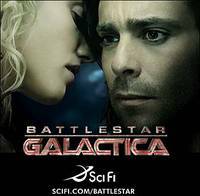 If you have seen ''Battlestar Galactica,'' which began its second season on the Sci Fi Channel on Friday, you will know that this Galactica only vaguely resembles the ship that previously bore that name, when ''Battlestar Galactica'' first flew on prime time in 1978, square in the shadow of ''Star Wars.'' And it certainly does not resemble the Enterprise, the ''Star Trek'' vehicle that has defined the visual and thematic vocabulary of television science fiction for four decades. On the Galactica, there is no captain's chair; there are no windows full of stars. The command center is busy and dark, protected deep within the ship the way it would be on an actual military vessel. As the actors move from room to room, hand-held cameras swoop behind them, closing in on them claustrophobically. The characters do not travel heroically from planet to planet, solving the problems of aliens. There are, in fact, no aliens at all. The New York Times Magazine > Beck at a Certain Age. Photographs by Raymond Meier, Paolo Roversi, and Nobuyoshi Araki. The New York Times: Camera Men.